Castalla city of Alicante and capital of the sub-county of its Foia belongs to the Valencian region of L'Alcoià i Comtat. At the foot of its renovated castle and birthplace of the emblematic Valencian writer Enric Valor, its streets run full of history. A festive population that, among others, celebrates its famous Moors and Christians at the beginning of September, offers its visitors its rich gastronomy and its unique natural environment of mountains and valleys just 30 minutes from the beach. Within this space, in its main street, the historical center of the city, is the restored Rural House Primavera d'Hivern with all the amenities that will allow you to enjoy and relax from this town house. - Capacity: 8 places. 1 single room for 1 person. - 2 double rooms for 4 people. - 3 extra seats. 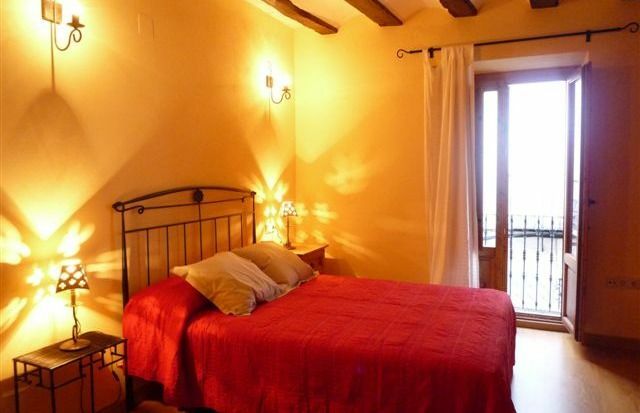 - Non-shared rural house of 3 floors located in the historic center of the city, completely renovated. Completion of rehabilitation works: year 2008. - 3 individual bathrooms with shower. 2 kitchens 2 dining / living rooms. - 2 TVs 1 washer and 1 dryer. - Heating by electric radiators in all rooms. Fantástico puente de Semana Santa hemos pasado en casa de Emili. En plena calle Major, en el centro antiguo del pueblo, a dos pasos de la iglesia, a tres del parque del pueblo y a unos cuantos escalones del castillo de Castalla. Silencio y tranquilidad en el pueblo y pocos coches, por lo que mis niñas y sobrinos se pasaron todos los días montando en bici calle arriba y abajo hasta acabar reventados. Magnifica Passtiseria junto a la vivienda y lo mejor, la calidez y los espacios de la vivienda, los niños tenias sus rincones y nosotros los nuestros sin molestarnos unos a otros. Gracias Emili y Luis por los espectaculares paseos en bici por la sierra de Castalla y la agradable pero durisima subida hasta el Xorret del Cati, REPETIREMOS cuando estrenes nueva bici de bit. Hemos recibido el 2011 en Primavera-D'Hivern. El primer día la casa estaba un poco fría, pero una vez se calentó estuvimos muy a gusto. La casa está muy cuidada, muy bien equipada y todo muy limpio. Muchas gracias por todo.